"He shoots, he scores!" Or, as some viewers heard on Rogers Hometown Hockey for the first time on Sunday, "Kitâskwêw, pihtakwatâw!" Or, as some viewers heard on Rogers Hometown Hockey for the first time on Sunday, "Kitâskwêw, pihtakwatâw!" 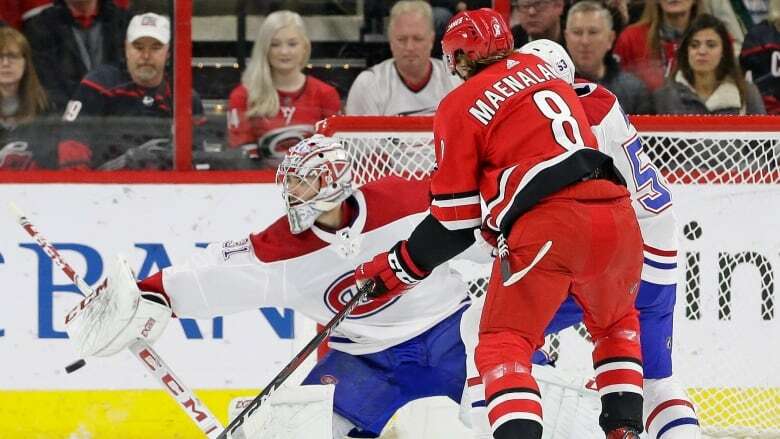 The Aboriginal Peoples Television Network aired Sunday night's game between the Montreal Canadiens and Carolina Hurricanes in Plains Cree — the first ever NHL game to be broadcast on television in that language. John Chabot, a retired NHLer from the Ottawa area, provided analysis during the game and hopes the broadcast will pave the way for more games to be called in Indigenous languages. "It was so cool," Chabot told CBC Radio's Ottawa Morning. "It couldn't have been a better game. It was a playoff game without being the playoffs." The Hurricanes rallied to beat the Canadiens 2-1 in overtime in a game with Eastern Conference playoff implications. But for many viewers, the scoreline was secondary, Chabot said. "It's not just about hockey, it's about preserving a culture that we've had for centuries and moving it forward." While the play-by-play and colour commentary were called in Cree, Chabot himself does not speak the language. His analysis was translated from English for the broadcast. Chabot's family comes from Kitigan Zibi Anishinabeg First Nation, where the mother tongue is Algonquin. He said he would like to see more NHL games being called in other Indigenous languages, including Algonquin. "We're hoping this is what happens next year, that it does become a monthly or weekly thing where our languages are showcased through a national medium, which is hockey." Sunday wasn't the first time an NHL game has been presented in an Indigenous language. CBC North broadcasters called an NHL game in Inuktitut during Hockey Day in Canada in 2010. Hockey Night in Canada began broadcasting in Punjabi in 2008. Chabot believes Canada's Indigenous communities are an untapped resource for the NHL, not just on TV, but on the ice, too. "They've gone through Europe, they've gone through college, they've gone through major junior," he said. "NHL pro hockey wants to find the next thing ... and communities in the North and communities on reserve are the next step." An earlier version of this story said Sunday night's game aired on Hockey Night in Canada. It aired on Rogers Hometown Hockey.